My 15-year-old son is built exactly like me, thin and wiry, while my 13-year-old daughter is the picture of her dad – not overweight, but stronger and heavier with very broad shoulders. Unfortunately, she’s getting unwanted attention about this from family members and so-called friends. Where do I start with this one? This is a tough situation to be in because as you are experiencing, thirteen is not the age you want attention brought to your body. I think there are a variety of strategies you can implement that will help. Make it a family rule between the adults that body size is not to be discussed: yours, theirs, or your children’s. Never make comparisons between your son and daughter. Help everyone focus on other aspects such as their senses of humor, their kindness, and their talents and abilities. Shift the focus away from the physical. And if someone makes a comment, gently change the subject with, “We’re just grateful we have two healthy children. What’s new with you?” Make sure you’re modeling this by not making negative comments about your body or others’. Sometimes, we’re in such a habit of commenting on sizes (“She is too big to wear a dress with patterns” or “Look how thin she is – lucky!”) that we don’t even recognize we’re doing it. At thirteen, your daughter is aware of how her body is alike and different from her friends’ and others. Help her find the positives, such as being tall enough to reach the items off high shelves or being strong enough to compete in a sport she loves. There are some examples online of how pictures are digitally altered to change someone’s appearance. Share these with your daughter and talk about how what she sees in the media is not always reality. Seek out role models with different body shapes that your daughter can look up to and be reminded that we all come in different sizes. 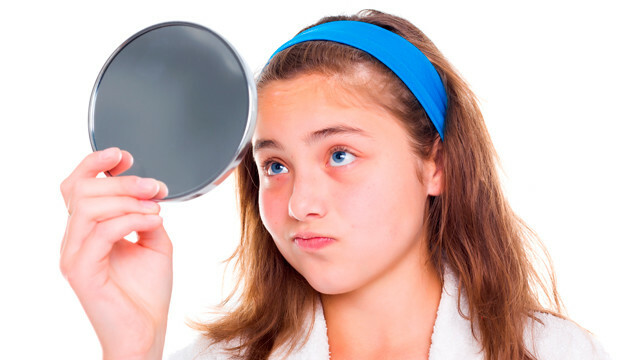 Finally, make sure that your daughter’s self-esteem is not based on her body image. What does your daughter do well? What does she like about herself? Self-esteem should be comprised of what is in your control. Your body frame, how tall you are, and your bone structure are not in your control. As you mentioned in your question, many of these characteristics are genetic in nature. Perseverance with the difficult math problems or being kind to animals are characteristics of healthy self-esteem. Help her to feel positive and confident in who she is (thoughtful, intelligent, dedicated) and what she can do (be a good friend, always try her hardest, stay focused) rather than what she looks like. You might also check in with your son as well to make sure he is not experiencing any unwanted attention about his appearance. He may be wondering why he can’t be a different body type than he is. doing is working. Do you have any recommendations to stop this behavior? How about strategies to help my other little one (six months old) not grow up to be a biter? Biting is a very common occurrence in babies and toddlers. There are a variety of reasons why toddlers bite. Insight on the reasons your 2-year-old is biting will help you stop this behavior. Toddlers bite for two main reasons: to gain attention; or to express emotions. It is really important for you to have a clear picture of the circumstances occurring at the time of the incident and how the providers at the childcare center are responding to the biting. As much as you can, make the responses be consistent so your child isn’t receiving mixed messages at home and at the center. If your child is biting during a quiet time or when not interacting with others, it is most likely for attention. What can be done so your child has some positive attention throughout the day? Brainstorm this with the caretakers. If your child is biting during an interaction with another child, it may be because your child is frustrated or upset. If your child is verbal, help substitute actions with words. Help develop his/her vocabulary with words such as “I’m mad.” If your child isn’t verbal yet, help by removing your child from the situation and filling in the appropriate response: “You are mad at Joey for taking your toy.” In every situation, firmly state that biting is wrong and that your child cannot bite. Resist the old adage to bite the child back. This only sends a confusing message to the child: Biting is wrong, unless you are the grownup. Then you can bite. Plus, you may harm them. It may be a battle of wills between children at the center, so as much as possible, have the caretakers be close by to mediate conflicts before the biting occurs. There is no need to worry about your 6-month-old growing up to be a biter. At six months, your child explores the world with her mouth. This is natural. The steps you take with your older child can be implemented before any biting incidences occur. Children need to express their emotions. Help your child develop other methods for that expression rather than biting. If the problem continues past the toddler years, definitely discuss it with your pediatrician. Next articleYour Body of Water!